Low-key British comedies have a tendency to come and go. Just brilliant. Barratt delivers a comedy performance for the ages. When can we see it again? Cinema is littered with tortured true detectives and hard-boiled bad lieutenants, but there’s never been anyone quite like Bruce Mindhorn. The deranged brainchild of writer-stars Julian Barratt and Simon Farnaby, this sublimely silly mock biography of sorts follows washed-up British TV actor Richard Thorncroft (played by Barratt), who we’re introduced to via a crudely-packaged sizzle reel culled from the ’80s heyday of the titular light entertainment police procedural. To describe Mindhorn as Thorncroft’s alter ego is especially accurate because it’s not entirely obvious where one character ends and the other begins. Which is exactly the point and precisely why the film is so damn funny. Jumping forward to the present day, we meet a balding and badly out of shape Thorncroft in a poky flat in Walthamstow. It quickly transpires that he’s been dining out on his short-lived popularity ever since Mindhorn was pulled following its star’s indelicate public comments about his fellow cast members. 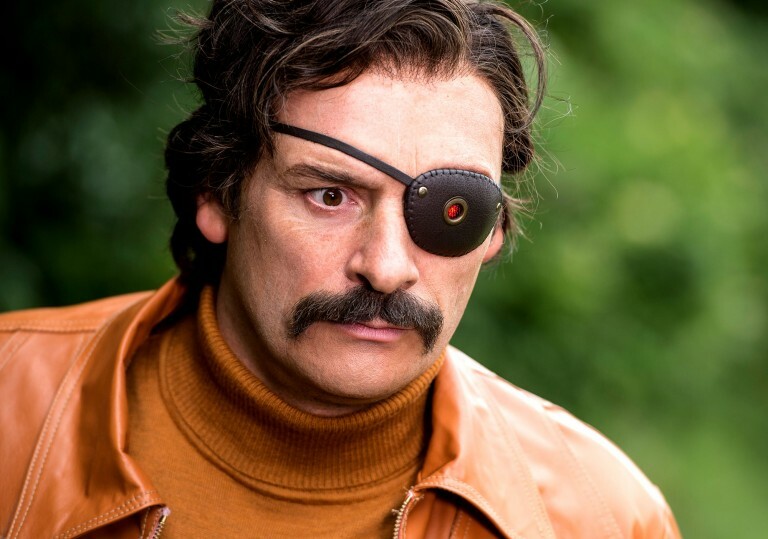 An awkward reunion is on the cards when a delusional Mindhorn superfan goes on a killing spree on the Isle of Man, the setting for his favourite show (which he doesn’t realise is a show), informing the local constabulary that he’ll only negotiate with the “real” Mindhorn. Sensing an opportunity to massage his bruised ego and snag some much-needed media exposure, Thorncroft dusts off his tan jacket and matching roll neck sweater, snaps on his “bionic” eye patch and hotfoots it to the ordinarily sleepy coastal town of Douglas. This could have been another case of an amusing concept failing to make the transition to fully-formed comedy feature. The kind of film that has its moments but doesn’t quite hang together, no matter how much you will it to. No such cause for concern here, as everyone brings their A-game in what is a consistently farcical, frequently hilarious hat-tip to a particular sense of British humour. Cult anti-sitcoms like Bottom and Garth Marenghi’s Darkplace are the most obvious touchstones, not to mention Barratt’s hitherto most-beloved creation The Mighty Boosh, which incidentally provided a semi-regular outlet for Farnaby’s like-minded brand of character comedy. The film also gently ribs – maybe a little too successfully – cosy teatime detective series like Bergerac (listen out for a John Nettles namecheck) and The Professionals, with their quaint ideas of alpha masculinity and rural life. Apropos of nothing, Farnaby plays a chiefly-shirtless Dutch man named Clive, who is the perfect foil for our unlikely hero. Where once Clive took a backseat as Thorncroft’s stunt double, now he’s shacked up with ex-Mindhorn totty Patricia (Essie Davis) and cruises around in a vintage sports car, both of which Thorncroft used to enjoy making purr. Worse still, Mindhorn bit-parter Peter Eastman (Steve Coogan) has found fame and relative fortune in a long-running spin-off show. The sweet irony here is that Coogan recently cashed in on his own comedic legacy with the Alan Partridge movie. A trivial observation, perhaps, though we suspect that Coogan must have been at least a little bit peeved to learn that Mindhorn is far superior to Alpha Papa. 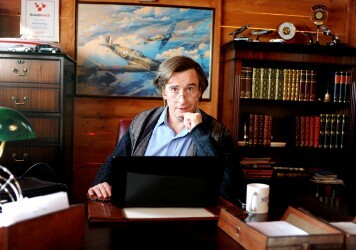 Steve Coogan brings his sparkling character comedy to the tedious tale of a radio station siege.